While Daphne was pursuing her Masters degree in economics in 1986, she discovered her interest in real estate. In 1992, she found her niche in industrial brokerage and has kept this passion ever since. She started her focus in Flushing, Queens, where she is known as the area specialist. Soon thereafter she expanded her business into western Queens and Brooklyn. In fact, she was the first Asian female industrial broker who explored the Brooklyn market in the early 1990s. Daphne is fluent in English and Chinese (Cantonese and Mandarin) which provides her with a competitive advantage to be able to assist a broad spectrum of Chinese immigrants and overseas international businessmen alike whom require commercial real estate services and throughout the years, she has helped hundreds and thousands of customers in fulfilling their needs. She also has developed and is constantly developing strong relationships and ties with many property owners and developers, allowing her to procure deals before they even hit the market. Her motivation, dedication, persistence and professionalism in business have earned great trust and respect from her customers and clients, domestic and abroad. With over 20 years of experience, Daphne has expanded her horizon into investment acquisition, property development & conversion as well as property management. As a partner of Harvest International, she has played a crucial role in growing the company by maintaining strong relationships, and closing complex transactions such as ground leases, leases with purchase options and private funding. Daphne graduated from Queens College with a Masters degree in economics. 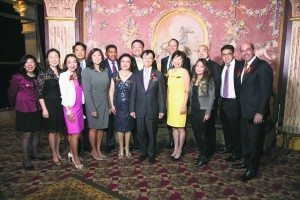 She is a member of the Commercial-Industrial Brokers Society of Long Island and the Central Lions Club of Flushing. She is also a sponsor and committee member of the Greater NY Chinese Community Dollars for Scholars. 1992 – Leased approximately 150,000 square feet of industrial space to multiple tenants at 40-22 College Point Boulevard in Flushing, Queens, NY. This old industrial site was formerly occupied by Con Edison and was later developed by the Muss Development Company into a 3.3 million square foot mixed-use development today known as Sky View Parc. 1993 – Represented the purchaser in the sale of a pre-foreclosure industrial building located at 1042 Atlantic Avenue in Crown Heights, Brooklyn, NY. 1999 – Leased a 55,318 square foot 1-story warehouse plus 12,000 square feet of parking located at 1717 Flushing Avenue in East Williamsburg, Brooklyn, NY. Daphne was the sole broker in this transaction. 2000 – Leased 100,000 square feet warehouse space at Bush Terminal located in Sunset Park, Brooklyn, NY. Daphne represented both the landlord and tenant in this transaction. 2003 – Structured and closed a lease-with-option-to-buy transaction located at 2-39 54 Avenue in the Hunters Point South neighborhood in Long Island City, NY. 60,000 SF industrial building with 10,000 SF land. 2005 – Negotiated and closed a build-to-suit purchase transaction for a 25,000 square foot industrial building located within the Heartland Executive Park in Edgewood, NY. 2008 – Represented both the buyer and seller, sold an 80,000 square foot 1-story industrial building with 15,000 square feet of land located at 110-1 – 1107 Metropolitan Avenue in East Williamsburg, Brooklyn, NY. Charles & Daphne Chan & Seth Kupferberg. On March 29, 2013, Charles and Daphne Chan attended the gala of the Queens Museum of Art (an art museum and educational center), located in Flushing Meadows Corona Park. 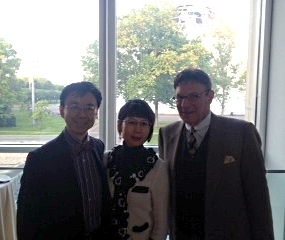 Seth Kupferberg, the QMA’s board of trustee kindly invited the commercial real estate couple to this exciting event. “The Panorama of the City of New York,” a 9,335 square foot architectural model originally built for the 1924 World’s Fair, containing every constructed building in all boroughs before 1992 was displayed, and nearby it, was the reception–also near the new expansion of QMA. Major contributors to help fund this large expansion project included government sources, Queens Borough President Helen Marshall, Mayor Michael Bloomberg’s office, the state, and the City Council. In addition, the museum itself raised $2 million; Charles and Daphne were delighted that they were able to partake and support the arts and the Queens community.